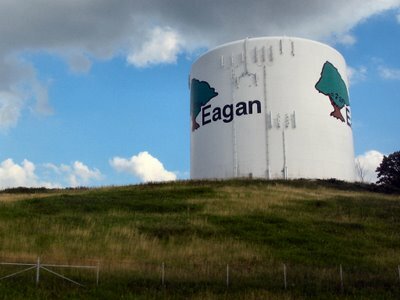 Sitting upon a hill in Eagan, there are several of these water towers around the city. They all have the same shape and the same paint job with the horrid looking tree. Now the latest craze is to add these long shaped metallic objects that double as cellular antennas. Those antennas are everywhere now a days, if you take the time to look closely. I lived in Eagan for quite a while before I realized that there was more than one of these! :) My Dad used to tease me that they were mobile water towers! :) Now I guess that is an entirely accurate title!